If you are able to get out of bed early and the sky is clear, equipped with binoculars you should be able to catch a fast-moving comet as it swings by Earth at about 32 lunar distances over the next few days. The best time is just prior to sunrise as the comet will be higher in the sky in the East. Use Jupiter as well as bright stars Vega and Arcturus to get your bearings. With each day the comet will rise earlier and will appear higher in the sky as the chart below shows; comet position at 5am for the next week. However it will diminish in brightness as it moves away from Earth on after February 11th. Comet 45P over the next few days starting Feb 10th. This isn’t the closest a recording of a comet passing near Earth, but it does make it to the 8th spot since modern observation and have been keeping track of near Earth objects (1950). Back in August 15 2011, it happen to pass even closer, only 23 lunar distances, making it also the 5th closest comet approach. 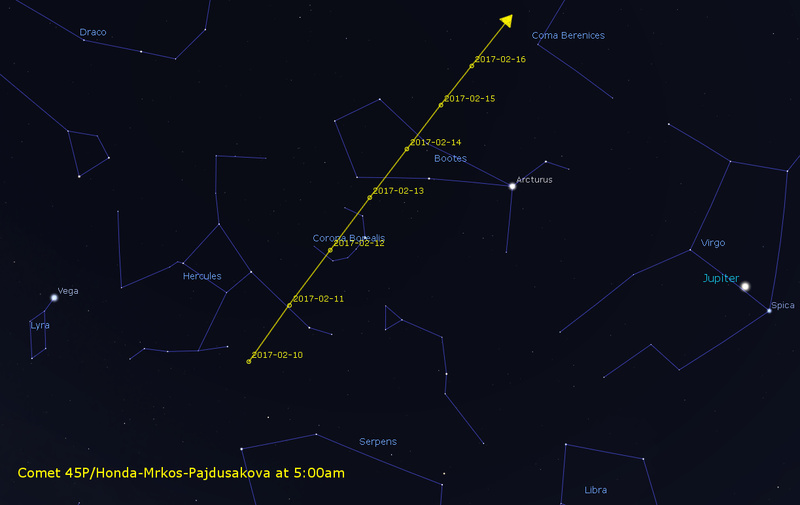 This entry was posted in Chart, Observing and tagged Astronomy, Comet, sky chart, Space by Benoit Guertin. Bookmark the permalink.